I’m not a very effective gardener. Last season both my carrot and lettuce crops failed to thrive, but a series of interesting and exotic weed did very well. Although we do not have the typical seasonal weather the east coast and mid west do where I live, we do have some seasonal changes. One gardening rule is that you are supposed to prune roses in January and February while the buses are dormant. I have three rosebushes; one humongous, one medium and one mini rosebush. After pruning the two large bushes, raking up the dried sycamore leaves and pulling out the two dead cherry tomato plants, I decided not to prune the smallest bush. It really had very few branches and the leaves were still green. When I finished cleaning, the rosebush, one green vine and two succulents were the only green plants still standing in a very stark landscape. 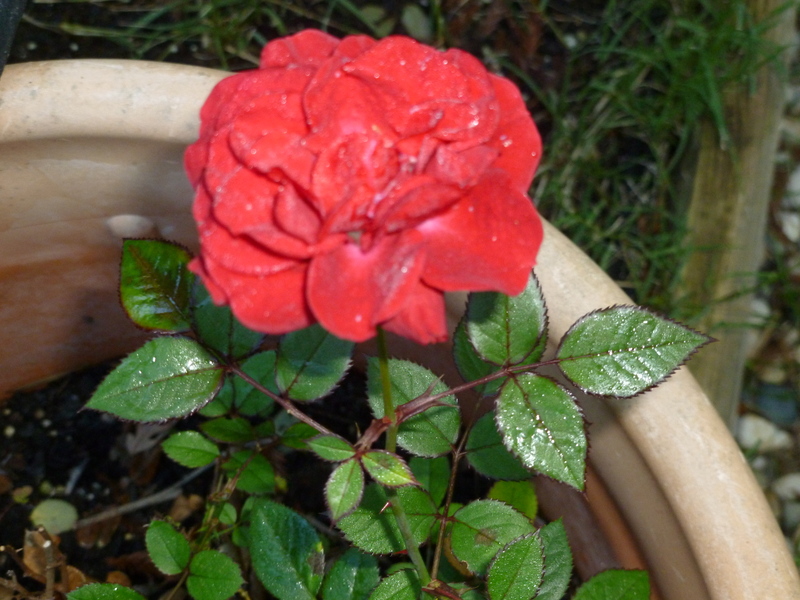 A week later, the rosebush produced one bright red perfect rose. It was, and is, the only point of color in the garden. Seeing the rose lifted my spirits. It reminds me that there is hope, beauty and joy in the world, not just sadness and loss. ← You can eat an elephant – just take one bite at a time.